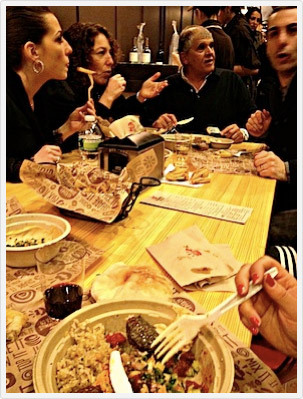 Last night, Danielle and I had the pleasure of attending The Hummus & Pita CO.'S pre- opening press party. 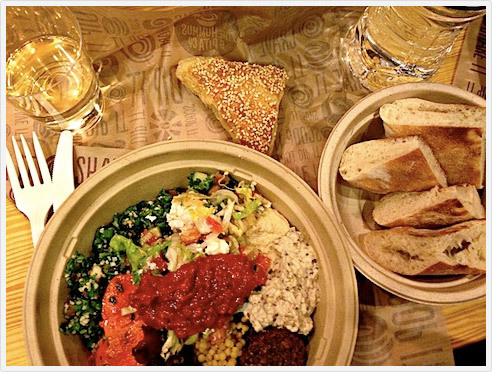 A ''fast casual" spot conveniently located on the border of Chelsea, Union Square and Greenwich Village, The Hummus & Pita Co. serves up fresh made healthy Mediterranean food. It's DIY style, which I love; you choose either a pita, laffa (a wrap), bowl or platter to house your meal. I settled on a bowl. But what to put in it? There were so many options to choose from, and they all looked and smelled!.. great. At the hot bar station, there are several different kinds of meat (chicken, schwarma, gyro, steak, and taboon- chicken or steak cooked in a special oven) as well as falafel, beans, and grains like Israeli couscous and rice-and-chickpeas. The cold bar gives Whole Foods a run for its money, with tons of vegetarian options like marinated beets, seasoned carrots, Greek salad, pickled jalapenos.. I was a little greedy over here, but the server who was helping me was excited to tell me about his favorite dishes. Finally, a piece of fresh Pita! It was warm and doughy, and had just been made in their brick oven..
By the time I'd finished at the counter my bowl weighed about three pounds, no joke. I also took advantage of the bourekas (sesame-topped puff pastry filled with spinach, cheese or potato) and white wine being passed around. For dessert: raspberry-walnut rugelach (a traditional Jewish pastry, and a very New York treat) and baklawa. We found a seat at a long communal table (handmade locally in Brooklyn out of reclaimed bowling lanes!) and chatted with. some of the other guests. Everyone was quite taken with the menu, and it's located in a convenient spot for a healthy, filling and comforting lunch. And, as usual, so lovely to catch up with Miss Danielle. After Danielle and I parted ways, I met my friend Ryan at Grassroots Tavern on St. Marks Places. It’s a nice place to escape from kite usual crazy around St. Marks (underage NYU students; Gossip Girl enthusiasts like myself). Nothing beats a good dive. It was snowing lightly and the air was frigid- almost as cold as in my bedroom. Once home, I crawled under the covers with a book and homemade juice pulp crackers (which are unexpectedly addicting) and read until my eyes burned. Good food, good friends, and a night out that ends up cozy in bed? My idea of a perfect evening. Do you like Mediterranean food? I've been on quite the hummus kick or late... black bean + cheddar quesadillas have been part of my lunch almost every day for the past week! What does a "good night'’ mean to you?